Charming Ahoy Matey pirate costume. Size (Toddler): Medium(size: 3-4), Large(size: 4-6). 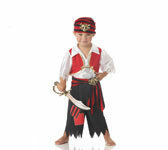 This pirate costume is designed to emulate typical pirate captain encountered on a pirate ship.